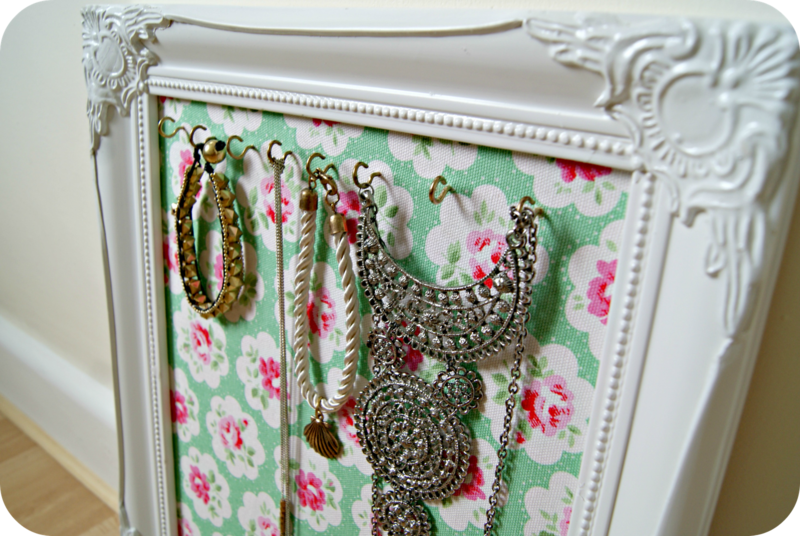 DIY shabby chic jewellery organiser! 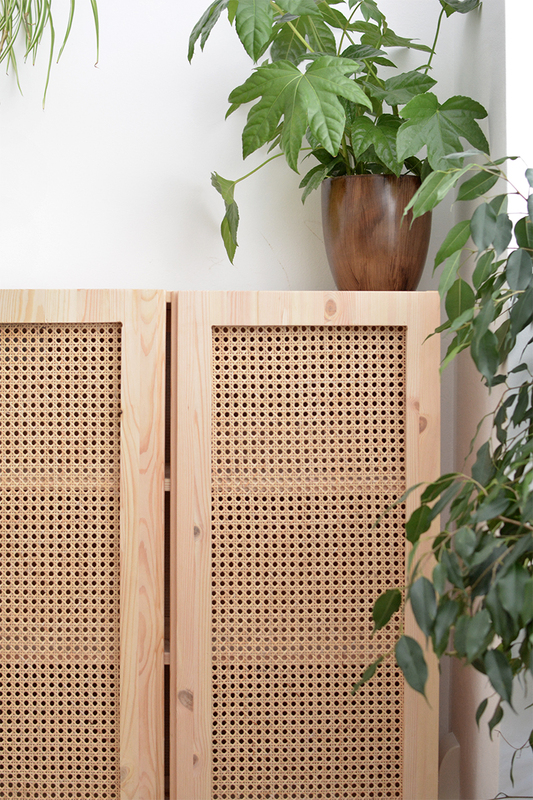 so excited about this DIY! I hoard jewellery and am always looking for ways to store it.. I came across a great DIY on pinterest where someone had covered the inside of a frame with chicken wire and hung all their earrings on it. I don't wear earring's but have a million and one necklaces so I changed a few things and came up with this version! 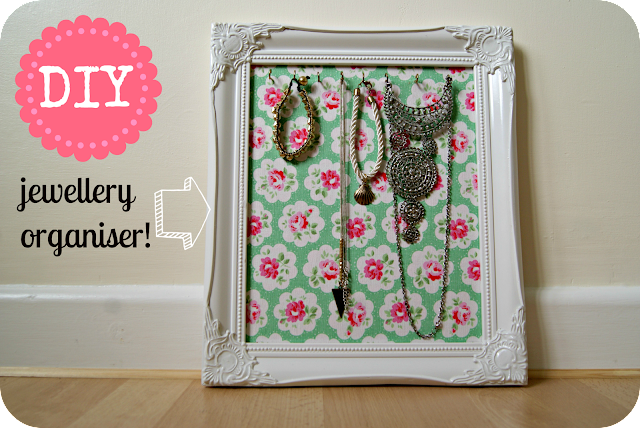 Its so simple all you need is a frame, some fabric, glue and some small screw hooks. take apart your picture frame and remove the glass (you won't need this again!) take the back of the frame and use it as a template to draw around a piece of fabric. cut the fabric rectangle out and leaving a few centimetres excess. I used some cath kidston fabric that I'm a little bit in love with! lightly cover the back of the frame with glue and place on the fabric, rub out any air bubbles and tuck the excess fabric over the back and glue down. place the fabric coated backing into the frame again. now all you need to do is screw in some picture hooks and hang up your favourite necklaces! cute huh? 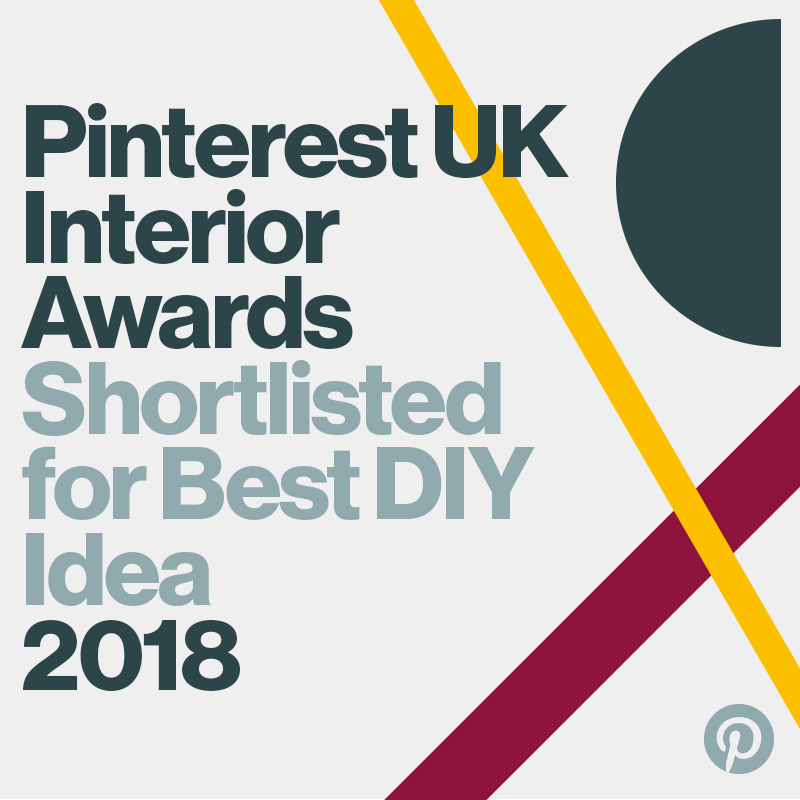 one pretty jewellery display in under an hour! If you don't have any fabric you could always use some wallpaper or patterned paper instead! Absolutely fab!! You find such wonderful ideas. Thanks for this I will be sure to have a crack at it. i think i might just be a little in love with that fabric too! pretty project girlie! I just actually organized my jewelry a couple of weeks ago. I have one of those velvet inserts that comes in the top drawer of a dresser...but I gotta tell you- I LOVE yours! You are one smart chick!